Since there multiple National Marine Sanctuary's go to this website to find the appropriate contact person. Monitor the abundance and distribution of the Mole crab - one of the most important herbivores on the beach, and a vital link in the sandy beach food web. Significant changes in mole crab populations can be an indicator of a larger problem in the ecosystem. Groups use rigorous monitoring techniques to survey mole crabs. If mole crabs are present in a sample, count and determine the size and gender of each crab found. An optional project is to dissect Mole crabs to inspect for a parasitic worm within their midgut. Mole crabs are hosts to a parasitic worm in the Phylum Acanthocephala. When birds and sea otters eat infected crabs, they too can become infected. We monitor these worms to learn more about the life cycle, seasonal cycles, and prevalence of the parasites in the populations of mole crabs along our coast. Most of the youth participants are of High School age. Equipment needed can be borrowed from the LiMPETS coordinator. Leaders will be required to take training from the LiMPETS coordinator. 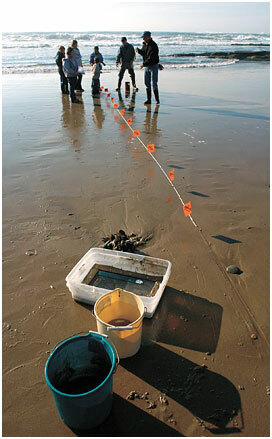 Trend analysis to determine the population growth or decline of Mole Crabs. Each group will schedule monitoring time with the LiMPETS coordinator in their area. A significant commitment by the teacher or adult leader is necessary to coordinate this project.